I couldn’t help it. It happened again: some old comics got bound. 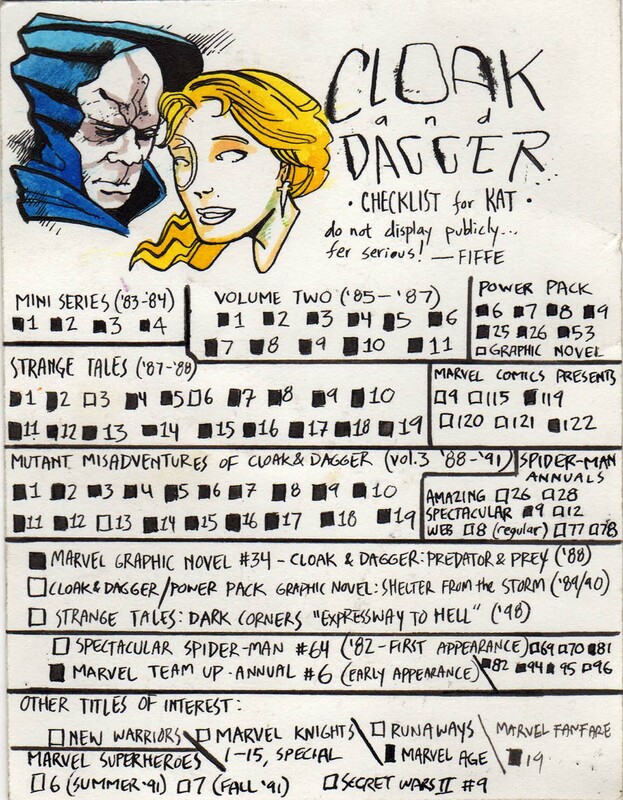 It was Cloak & Dagger’s turn. Created by Bill Mantlo and Ed Hannigan, this duo has been a favorite of mine (and Kat’s) for a while now. I thought their combined titles and cameos would’ve made a tight three book set, but there had to be a cut off point (I recall the duo’s return in the Marvel Knights title after a brief hiatus; I’ve bound all the material before that period). Here’s the reading order, including short stories, pin ups, odds & ends. 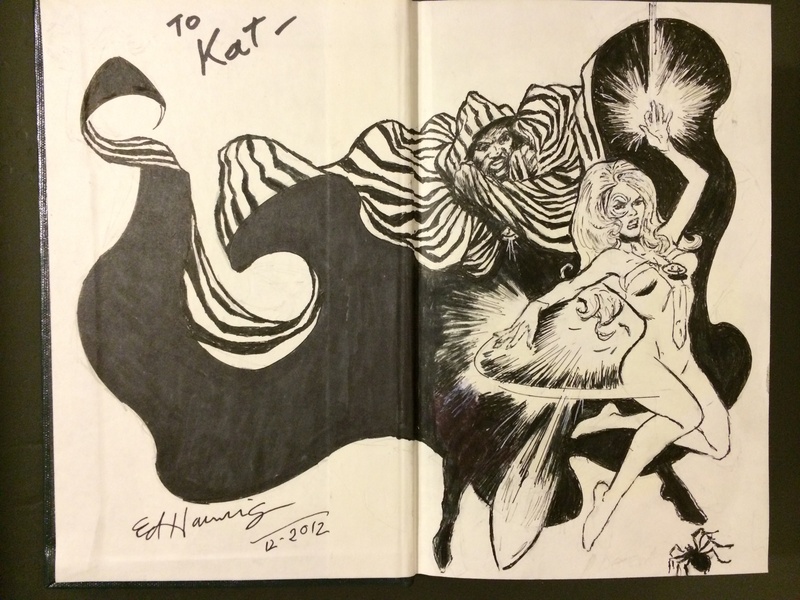 What bound set is complete without some sketches by related artist? Here’s a great double page spread by Cloak & Dagger co-creator Ed Hannigan (click to enlarge). 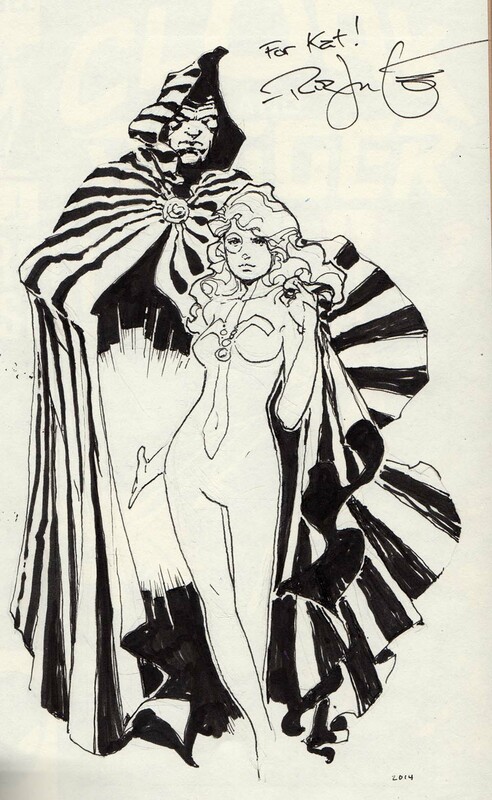 Beautiful drawing by iconic Cloak & Dagger artist Rick Leonardi. Fantastic double shot featuring Dagger and Esctacy by artist Mike Vosburg. Here is a dopey checklist I made for Kat …maybe 8 years ago? I’ve been known to try my hand and Ty & Tandy, but this here fulfills the list making side of my obsession. As I posted before, this binding habit is addictive. The process also takes forever: the research, the hunting down, the inventory & organizing… I want to get these books as thoroughly archived as possible. The results are worth it, though, and the original art by the respective creators makes it perfect and one of a kind. I appreciate the efforts Ed, Rick and Mike made in providing us with some great art to accompany their memorable comics. Dude… I ..OMG…. That is soo….. Beautiful. DAMN. DAMN. This is how a werewolf bite must feel like! I WOULD LOVE TO DO THIS! And you did CLOAK AND DAGGER! Now I have to. Damn. Double DAMN. I’ve been thinking about getting some of my stuff bound. 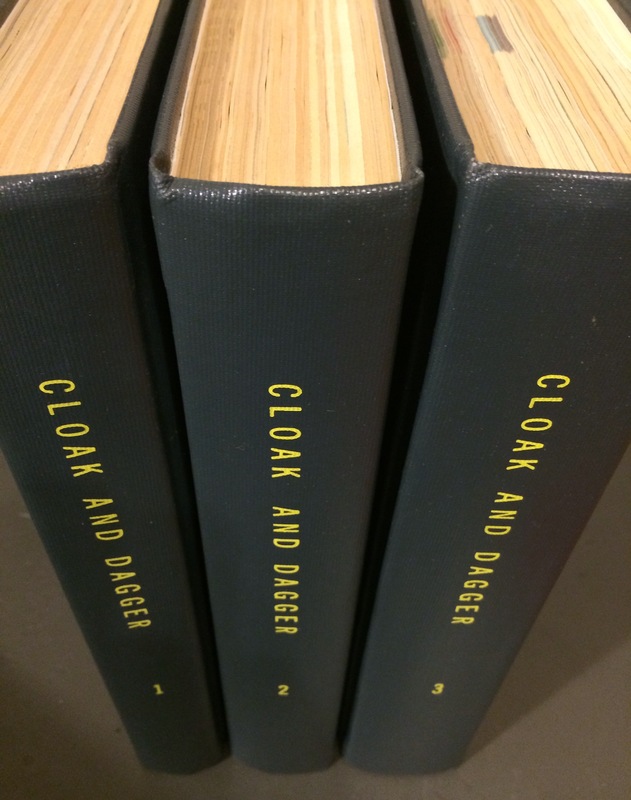 Are your bound volumes the most basic they offer or have you souped them up? That Ed Hannigan sketch is ridiculous. Did you add extra pages in the volume for the sketches? Yeah, my binds are pretty basic, as stripped down as possible. You can always ask for the bell and whistles – there are tons of options. The drawings were on the bookends, nothing added. That’s a difficult call because those annuals (and back ups etc.) carry far less weight and significance in C&D’s overall arc, but they ARE canonical. 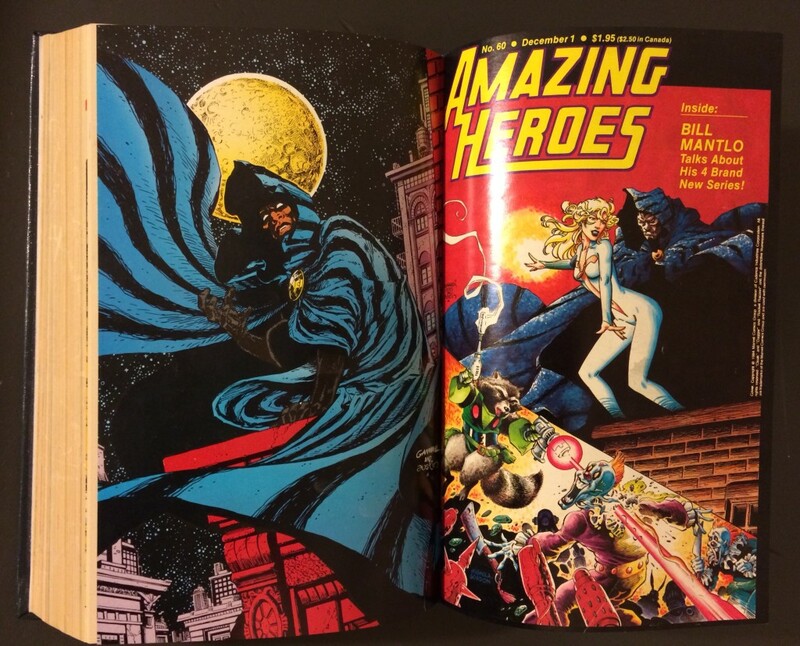 They’re not all potboiler inventory stories: the Amazing Annual 28 has a significant Mayhem story, for example, but it is a mere short story drawn by a less than stellar newcomer (not unlike the Marvel Comics Presents chapters). Their New Mutants issues were well written and beautifully drawn, so I feel they richly add to their “story”. The Atlantis Attack annual is a solid adventure which occupies the same space that the earlier Marvel Team Up annual is in. Are they essential? Not necessarily. It ultimately depends on what you want to read / look at / enjoy.